Men's Triple Tone Wedding Ring : LOVE2HAVE in the UK! A fantastic idea for a men's contemporary triple-tone wedding ring, this UK made zirconium ring has five parallel strips in a three-tone detail. The central stripe is black, and the others are natural grey. The three-tone effect comes cleverly created by combining matte and polished finishes side by side. The strips that flank the black are matte and the outers polished. Dividing all of these is a groove between each, engineered as a single piece while looking like silver and black strips assembled or inlaid with one another. 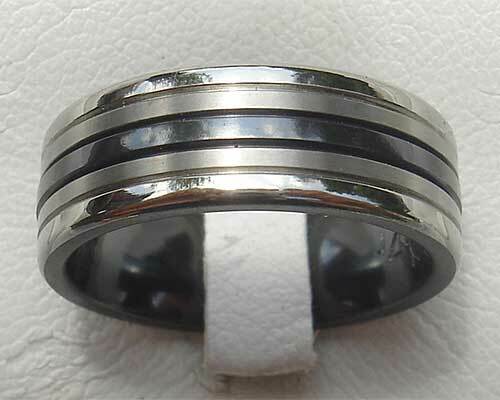 The ring is machined to a flat profile and measures 7mm wide here, but many other widths are available.